Me and the wife were going to move to Brooklyn. (it never happened but I told that story in my last post). So I had been busy boxing everything up and bubble wrapping my millions of paintings. I had to force myself to get out of the house and go do a drawing. 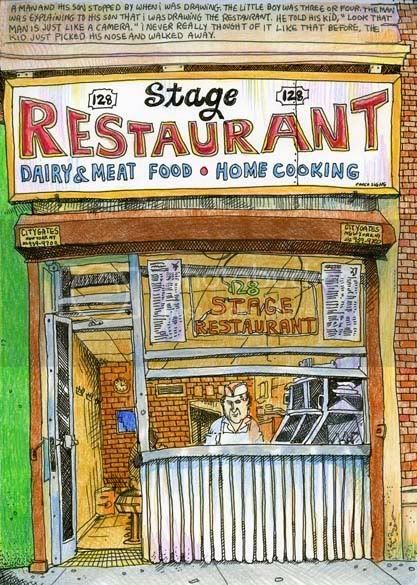 The stage restaurant is in the east village. It's right next to the off broadway theatre where Stomp is playing. Everyone coming out said the same thing. "You really captured the cook." People I know in the neighborhood would stop by to say hello and see my latest creation. hey Tommy, what can i say...that looks bloody awesome and make me green with envy. i'm a newbie to the whole watercolour thing, so you'll excuse me, but what material do you use: i see pen and ink, watercolour pencils (?). is there any chance that you sell, give away, donate, exchange your work? please let me know. I just use a black uniball pen and colored pencils. the brand name is prisma color. You should be able to get them in any art store. Sorry to hear about the apartment - I'd like to have seen your drawings of the views. Thanks for an excellent and inspiring blog - it's helped encourage me to get out and draw again.